Robson Ranch Arizona is a magnificent active adult golf course community halfway between Phoenix and Tucson. Upon completion, the community is expected to be comprised of approximately 4,600 homes. Residents enjoy all the benefits of active adult living in this desert oasis away from the congestion and crowds of the surrounding metropolitan areas. Amenities currently include indoor and outdoor pools, a state-of-the-art fitness center, hobby rooms, walking trails, tennis courts, softball field, fishing lake and more. An additional creative arts center and clubhouse add to the extensive lineup of amenities available to the residents. For those looking for a challenge there will also be 16 pickleball courts, 4 tennis courts, and a softball field available. The 18-hole Robson Ranch golf course provides a challenge for golfers of all skill levels. The semi-private course has membership options and is also open to the public. It features a pro-shop, restaurant and practice facility. There are 16 single-family ranch floor plans in this community that range from 1,286 to over 2,402 square feet. The tastefully designed homes include the latest desirable upgrades and sought after open floor plan designs. Many of the homes for sale enjoy magnificent views of the golf course and distant mountains. Homebuyers can select from the Traditions Series, and Premiere Series. Villa homes at Robson Ranch are attached single-level homes that have at least two bedrooms, two bathrooms, and a two-car garage. There are a variety of options with the villa homes provided by the six different models that feature open floor plans and outdoor living areas for entertaining. This community's residents are surrounded by mountain views, low desert and open space. Homeowners will find their own slice of paradise as they enjoy the world-class amenities and vibrant lifestyle options offered in the community. Several dozen clubs and interest groups meet regularly. Plus, an exciting array of activities, classes and events cater to the social requirements of today's active adult buyers. 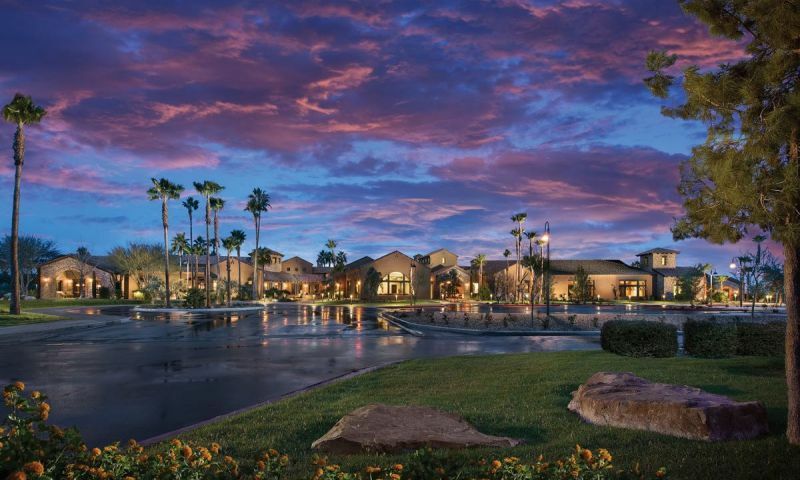 Robson Ranch is conveniently located near I-10 five miles from Casa Grande. The convenient interstate access puts Phoenix and Tucson in a central location to the community. Casa Grande is a progressive community rich in history and rural heritage that retains a small-town charm. It is well known for its recent commercial and residential growth and has emerged as one of the premier shopping destinations along the Phoenix-Tucson corridor. Residents can also rest easy knowing that medical facilities are in close proximity to the community. The Promenade Mall, Outlet Mall and several other popular big name stores are nearby. Robson Ranch is truly an amazing opportunity for active adults in the Phoenix, Arizona area. Clubhouse - 39,000 Sq. Ft. There are plenty of activities available in Robson Ranch - Arizona. Here is a sample of some of the clubs, activities and classes offered here. The Villa Home Series are attached, single-level homes. They include six different floor plans with two bedrooms, two bathrooms, and an attached two-car garage. The Verde floor plan offers a den that can be converted into a third bedroom. These new construction homes feature outdoor living spaces and open-floor layouts ideal for entertaining. The Tradition Home Series includes a variety of single-family home plans that range from 1,270 to 2,097 square feet. The Torrey, Laguna, Riviera, Carmel and Newport plans are available as both new construction and on a resale basis. The Coronado, Diego, Del Mar and La Costa are available only as resales. All plans offer exciting layouts with open kitchens and great rooms that give the homes an airy feel. The Premiere Home Series is designed to appeal to discerning active adult buyers who want ample living space plus flexible space for storage or guests. Expect to find an additional garage space or optional casitas on many of the Premiere Homes. Equipped with large great rooms and spacious gourmet-like kitchens, these homes are ideal for homeowners who like to entertain and host friends or relatives. Most plans are available as both new construction and on a resale basis. The Estate Home Series is for homebuyers who want it all. Options include both casitas and up to a 3-car garage. Homebuyers who are looking for a home that has the latest in high-end luxuries and upgrades need look no further than the Estate Home Series in Robson Ranch. In planning our move from Hawaii to Arizona - I did extensive research on gated gold communities here and found that Robson Ranch is a gem in the desert half-way between Phoenix Metro and Tucson - about an hour to each metro area! Our GM, Melanie and her staff do a great job and the lifestyle here is easy and relaxed - super amenities abound here! I will not , however, mention anything about the good real estate values here compared to Phoenix / Tuscon - it's a secret. As for the distance from here to the large metro areas mentioned above - as retirees, we count this as blessings - doing without the traffic and congestion is exactly why we chose Robson Ranch and the Casa Grande area! Love it here! People are very friendly. It has everything we need. It is a hidden gem where everyone is like family. A lot of great comments and I echo them all. This is a hidden gem in the greater Phoenix market. Most folks aren't willing to drive down from the main areas of Phoenix but I think the owners here are ok with that. Very easy to access off the freeway and although you have to drive a little to get to major shopping it is worth the peace and lack of congestion to be set back off the main shopping areas. Gorgeous clubhouse and everyone here seems to be unbelievably happy. I have not lived here but I've been to the neighborhood many times for meetings and just to eat and hang out at the restaurant, which is the best lunch around!! So many homes to choose from there seems to be something for almost every budget. After searching on-line and visits to several other active adult communities, I chose Robson Ranch because of community, quality, and location. As far as the community - great ammenities like the Sports Club with pool, spa, gym; restaurant, classes, and clubs. I think the quality of construction is top notch. The location is great because it is close to Casa Grande which has a hospital, shops, and restaurants and only eight miles from Robson Ranch. We are only 35 minutes from Chandler and mid-way between Phoenix and Tucson so close to everything you could want. Lastly and most importantly-the people of Robson Ranch. As a new resident I was concerned about meeting people. Well, I am very pleased to say that I've met many people here who have all been welcoming and friendly. I am very happy here and I highly recommend Robson Ranch. After a brief visit and a longer period of researching on the web, I finally was able to make the move and I brought a home there in Robson Ranch AZ. And I'am very pleased to say, that it is everything I expected it to be and even more. We bought our first home in Robson Ranch in 2008, on the golf course. Golf was our primary reason for purchasing at Robson. Now we have many reasons for living at Robson. The friendly community, great golf, state of the art sports center, Olympic pools, on site restaurant. You can be as busy or as laid back as your life style desires. We are very active and on the go all the time. I golf, my husband plays tennis and pickle ball. Evenings we fill with the many social activities from round robin dinners, game nights or just socializing with friends. Greetings from Robson Ranch in Sunny Arizona! I chose to move here in 2008 after exploring numerous other communities in AZ. I have never regretted my decision. The sun wakes me up in the morning and makes me eager to start my day. This community is so friendly and welcoming, (I'm single and did not know a soul when I moved in) The homes Mr. Robson builds, are in my opinion, well constructed an energy efficient. We also have so many choices of great clubs and social activities. I feel safe here! Come join us! We built our home over six years ago and this will be our first year as full time residents. We enjoy the facilities and have met so many wonderful people. There are so many activities to choose from and you can always find something to keep you busy. We are not at retirement age but looking forward to that day when we can take advantage of what Robson has to offer. We are Canadians and have been residents of Robson Ranch for several years; starting with the "Riviera" model and now in a "Talavera". One of the first things that attracted me to Robson was the fantastic indoor pool (being a swimmer); the gym and pool open at 5 a.m. for early morning risers like myself. Then - the other amenities are wondeful - beautiful outdoor pools, hot tub, a "fine dining rooom", great bar and grill, not to mention the pickle ball courts and A TOP NOTCH GOLF COURSE!!!! The list goes on. The friendliness of the people cananot be surpassed. On arrival we were greeted by the "Welcoming Committee" and I was also warmly welcomed into the Ladies Golf Club. The activities are endless,bridge and other card games, pottery, stained glass, quilting, bus tours, too many to begin to mention. You can be as busy and active as you choose to be. There are 'areas' of Robson - designated at Units - each Unit has a name - for instance, we are in "Sundance" - each year there is a block party in your unit - a great way to meet all your neighbors. I cannot imagine spesnding the 6 winter months (that Canadians are permitted to spend in the US) anywhere other than ROBSON RANCH. We moved into Robson Ranch in 2008 and built a larger home in 2010. This community has exceeded our expectations greatly. The golf course is great and the pickle ball courts add to our enjoyment. Social activities abound. We are Canadians who moved into our new winter home last December. Our experience with building a home with Robson Ranch was very good. Our sales person and design consultant worked with us to ensure our home reflected our needs and wants and assisted us to achieve our dream. The other homeowners are very friendly and welcoming, making it easy to develop new friendships and feel a real part of the community. We can be as busy or as relaxed as we please. There is always something going on if you choose to participate. We would highly recommend this retirement community to all who are interested. Top Notch!! We love to bring groups and eat at Robson's Ranch to the dining room, outside patio, board room or fireside room. The food is great, the service is great and the setting is lovely. We love to watch the sun go down from the main dining room. Great for parties and groups. We bought a "starter house" 3 years ago to try out the Ranch, and have just sold that and moved up to a bigger house on the golf course. We love it here, lots of amenities, great neighbors, over 50 clubs and activities, first class Bar and Grill, lovely championship golf course, etc. There currently are about 600 homes built and the newest homes under construction are duplex villas (lock and leave) in addition to a great selection of single resident models. We are in the RV Club, the Pickle Ball Club (16 courts and plans for 8 more), the Support Our Troops club, the theater club and more. We recommend the property highly to full time or part time residents who want to escape to a sunnier clime in the winter. There are homes for rent or you can try Robson's Preferred Guest program to check out this very active 55+ community. Home prices here are pretty attractive and it is a "younger" senior age group as it started in 2005-2006. There is good shopping nearby and it is easy to drive up to Phoenix, down to Tucson or out to San Diego. 55places.com is not affiliated with the developer(s) or homeowners association of Robson Ranch - Arizona. The information you submit is distributed to a 55places.com Partner Agent, who is a licensed real estate agent. The information regarding Robson Ranch - Arizona has not been verified or approved by the developer or homeowners association. Please verify all information prior to purchasing. 55places.com is not responsible for any errors regarding the information displayed on this website.